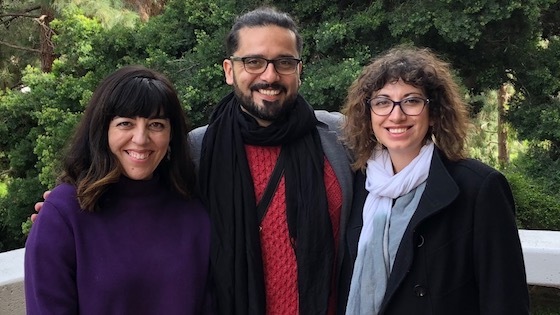 Dr. Romina Green (left) and Dr. Cristián Perucci (center) before his presentation on the relationship that Mapuche Political Movement has forged with Chilean and Argentine civil society, their respective States, and the great capital present in the territory for the last 25 years. February 15, 2019. Mapuche Political Movement in post Augusto Pinochet’s dictatorship era has breathed through its two lungs: political organizations, and rural communities. It has been characterized by the implementation of various political forms. Some of them have been framed within the margins of Chilean institutions (Congress, Counties, National Commission for Indigenous Development). Others have chosen to build up mechanisms that tend towards self-determination, which, in turn, oscillate between dialoguing postures and violent action. This talk aims to provide an analytical vision of the relationship that Mapuche Political Movement has forged with Chilean and Argentine civil society, their respective States, and the great capital present in the territory for the last 25 years. This main problem will be debriefed in three points, starting with a summary of the effective legal framework in Chile, which combines positive affirmation and repression policies against the Mapuche (1993 indigenous law, anti-terrorist law, ILO Convention 169). Secondly, describing the implementation of a neoliberal capitalism that, along with deepening social differences, reinterprets and reinforces old ethnic tensions. And last, thinking about the construction of a terrorist and criminal Mapuche discourse, a new form of racial discrimination, and a catalyst of Mapuche (counter)culture. Cristián Perucci received his Ph,D. from École des Hautes Études en Sciences Sociales (France). Among other titles, he has published «Funciones y significados de la esclavitud negra en el área pampeana-mapuche, siglos XVIII y XIX». Chungara, Revista de Antropología Chilena. Volumen 50, nº 1, 2018, pp 121-132, «La desunión como principio de la unidad mapuche». Chungara, Revista de Antropología Chilena. Volumen 48, nº 4, 2016, pp 731-734.